If you are just starting out in your medspa business or have just decided to add cosmetic treatment services to your practice, the best option for the first aesthetic laser you invest in would be a system that is versatile and that can provide multiple treatment options. With a multi-purpose cosmetic laser, you will have the ability to generate solid revenues streams for your business. With a wide variety of handpiece options, the Syneron eMax provides numerous treatment options via one system: acne treatment, pigmented lesions, leg veins, facial veins, laser hair removal, wrinkle reduction, skin tightening, skin rejuvenation. The eMax utilizes Syneron’s patented elos technology which combines, bi-polar radio frequency (RF), light energy and diode energy. The Palomar StarLux IPL platforms are known as workhorses. A medspa or medical practice can deliver several different aesthetic treatments to patients all via one base unit, used in conjunction with various handpiece options. Applications include: Laser hair removal, skin rejuvenation, wrinkle reduction, skin tightening, acne treatment, tattoo removal, leg veins. Read our article on the StarLux systems for a side comparison on the 300 and 500. The eMax runs many lasers hand pieces along with various IPL applicators. The Syneron eMax performs hair removal with the DSL handpiece. This is a true diode laser hand piece. The eMax also offers the DS applicator, this is an IPL hand piece that is also used for hair removal. The eMax is a taller unit and not quite as easy to transport as the StarLux 300. The eMax tends to be a more reliable system and doesn’t breakdown that often when compared to the StarLux 300. 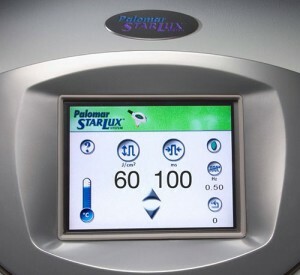 The StarLux 300 tends to have issues with the water system’s performance. The StarLux 300 and 500 both have an easy to use touchscreen that makes selecting handpiece power levels and milliseconds simple because it is all at the touch of a button. The cooling system seems to be the root issues for any malfunctions on the Palomar base units. The issues center on the TEC module located inside the cooling unit. Regardless of which system you select for your practice, both the eMax and StarLux deliver solid results with good efficacy.